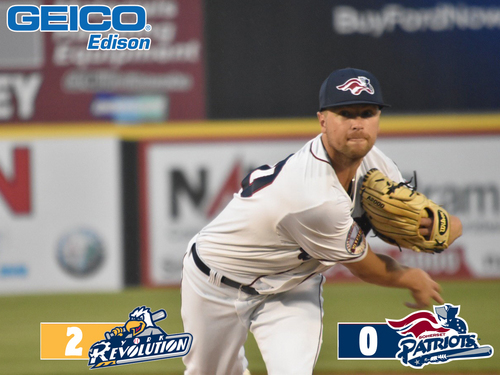 Bridgewater, NJ- The York Revolution (32-24, 64-55) defeated the Somerset Patriots (33-23, 68-51) 2-0 at TD Bank Ballpark on Friday evening. Click Here For Box Score! The Revolution broke the scoreless tie with a run in the top of the fourth inning on an RBI single by Isaias Tejeda. York extended the lead on a solo home run by Ryan Dent (16) in the top of the fifth inning that made the score 2-0. Logan Williamson (7-5) picked up the win with seven scoreless innings pitched, allowing four hits and recording six strikeouts. Stephen Perakslis (2-1) suffered the loss, allowing two earned runs on six hits in six innings pitched. Dustin Richardson got out of a bases loaded jam to earn his third save of the season. Earlier in the day, the Patriots won the continuation of the suspended game from August 17th on a walk-off RBI single by Nate Coronado in the bottom of the 11th inning. The 2018 Somerset Patriots Season presented by Ford will continue at home on Saturday, September 8th with a 7:05 pm game against the York Revolution. The game features Fireworks presented by Celularity and Irish Heritage Night. For tickets, visit www.somersetpatriots.com.